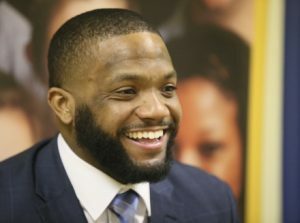 Maurice Clarett joined the ARCHway Board in January 2017. Maurice brings a ton of experience and has a passion to help change the stigma and support individuals and their families have dealing with the disease of addiction. Below is some background on Maurice. Maurice Clarett first became known for his football accolades early on in his life. In high school he was a name known throughout the nation winning USA Today’s national player of the year and a Parade All-American. His success continued on at Ohio State University. Maurice became the first and only true freshman to start at running back & set the freshman single-season rushing & touchdown record (1,237 yds & 18 TD’s) which was previously set by 2-time Heisman Trophy Winner Archie Griffin. The peak of this successful season came when Maurice scored the winning touchdown in a double-overtime win over the Miami Hurricanes. Making the Ohio State Buckeyes National Champions in 2002. Maurice has often been referred to as one of the greatest impact freshman collegiate football players to ever play the game by many sports enthusiasts. After that season Maurice fell into a spiral of poor decisions that cost him continuing success in football. Those decisions ultimately landed him to spend 3 1/2 years in prison. That time in prison only determined Maurice to have more success than he did before, not in football, but in life. Since Maurice’s release in 2010, he has been committed to restoring his life and reputation as a man who lives and acts with integrity, and is guided by the morals and values as dictated by his strong Christian faith. Most recently Maurice completed a documentary film, entitled: Youngstown Boys, about his life with ESPN in their award-winning film series 30 for 30. Maurice recently published and made available for sale, his journal that chronicles his struggles while away from his family. It takes an up close and personal seat to his life lessons learned while imprisoned. Maurice now travels speaking to schools, universities, churches, & business organizations sharing his story. Letting the people he speaks in front of know that it is never too late to change the direction of their life. His genuine delivery and authentic heart with every speech always leaves people inspired.